The Dutch painter Johan Barthold Jongkind spent most of his life in France, first as a protégé of the Prince of Orange and later as an independent artist. In 1855, disillusioned by the scant appreciation of his work at the Paris Salon and harassed by creditors, he abandoned the French capital and returned to his country of birth for a five-year period. Taking up residence in the port city of Rotterdam, where he remained in contact with his Parisian friends — particularly Corot, Rousseau and Daubigny, the members of the Barbizon School — and his Paris dealer, Firmin Martin, he concentrated almost solely on producing views of the surrounding landscape with its characteristic Dutch windmills and scenes of nearby harbours. The Museo Thyssen-Bornemisza View of the Harbour, Rotterdam, dated 1856, was executed shortly after Jongkind’s return to the Netherlands. By then Rotterdam was the most important port in northern Europe, located in a privileged enclave that could be reached both from the North Sea and from inland via the deep waters of the river Meuse. 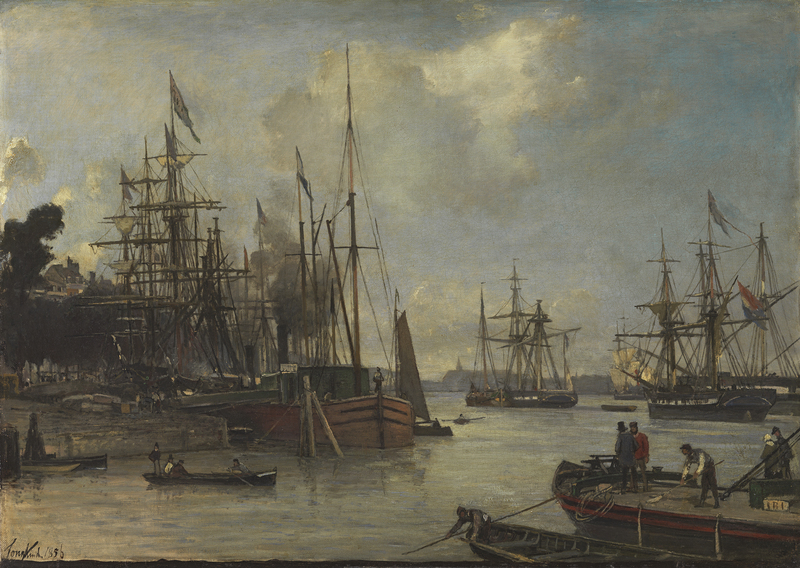 As in many other similar works, the artist depicts the quays of the bustling Dutch port with numerous moored boats in the process of unloading their cargoes.